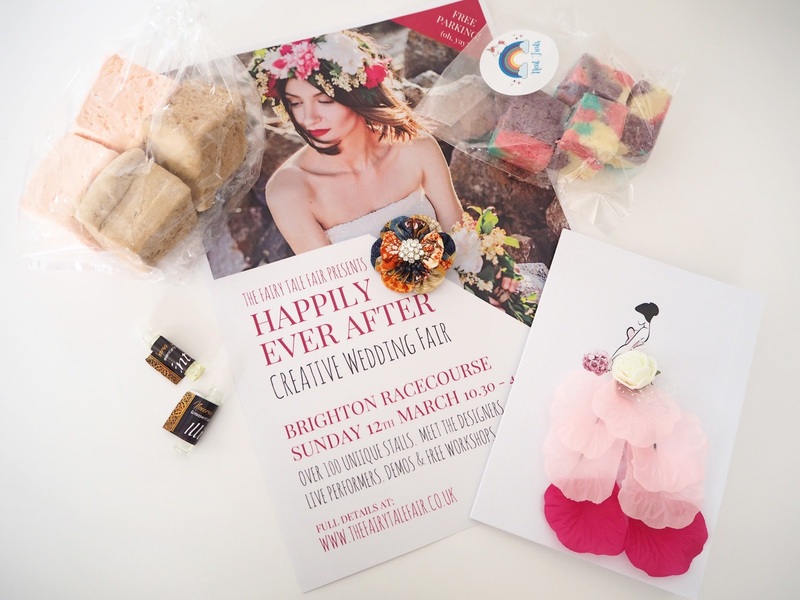 A couple of weeks ago I was invited to come along and view The Fairytale Fair's first ever Wedding Fair which was held at Brighton Racecourse. 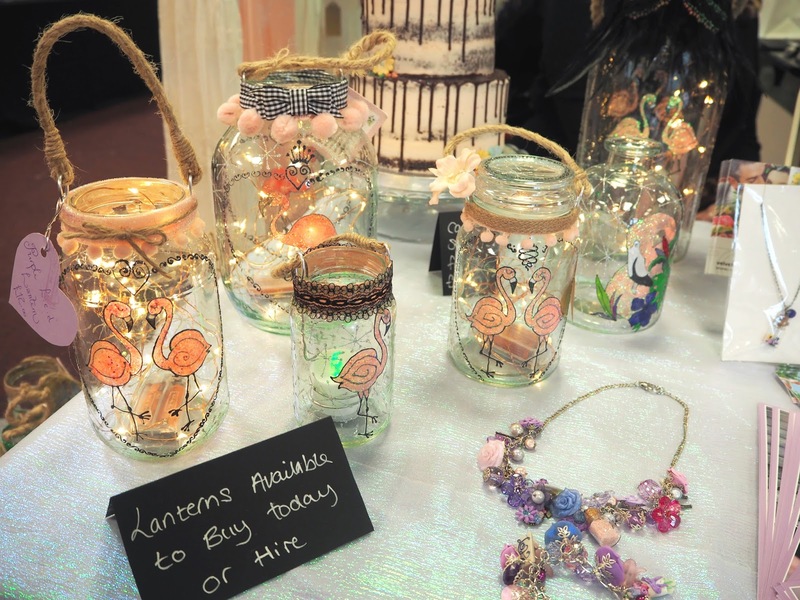 The Fairytale Fair was first established in 2012 and host whimsically themed craft and design fairs featuring makers from around Sussex. 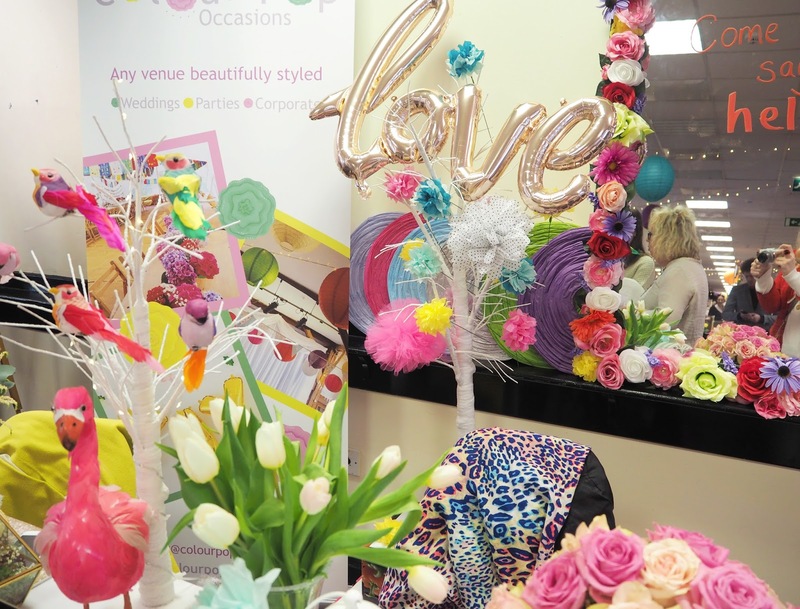 There first Wedding Fair showcased around 100 independent makers displaying everything from spectacular wedding cakes and florals bouquets to invitations, wedding favours and hair accessories! Although I am not getting married anytime soon this event felt very close to my heart. As some of you will know I design and make a range of jewellery which I sell in my Etsy shop, something I have done for about 8 years now. I think it's really important to support small, local businesses whenever possible and something that is handmade always feels so much more special. I love getting to know the people behind the business and finding out their stories. 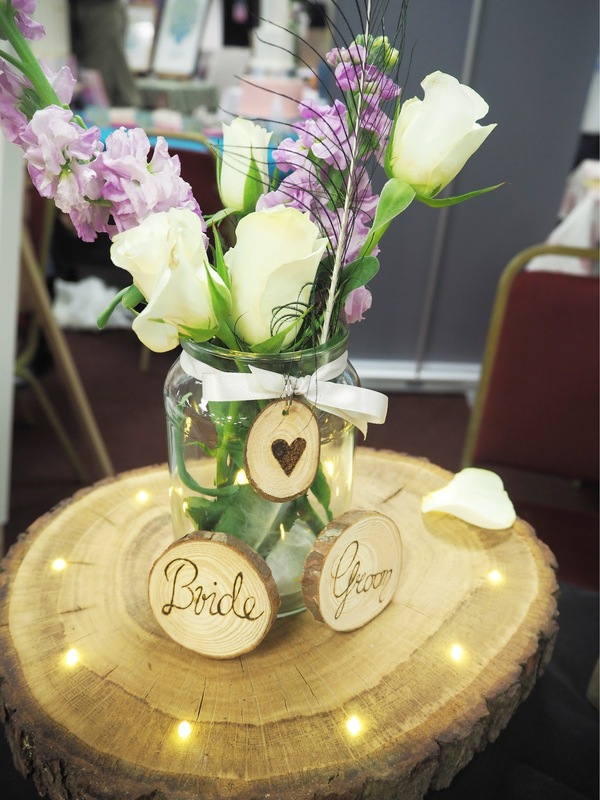 I think if you're looking to make your wedding unique, customisable and stand out a little from everyone else's then handmade is definitely the way to go! On the whole I'd say it's a lot more affordable too. 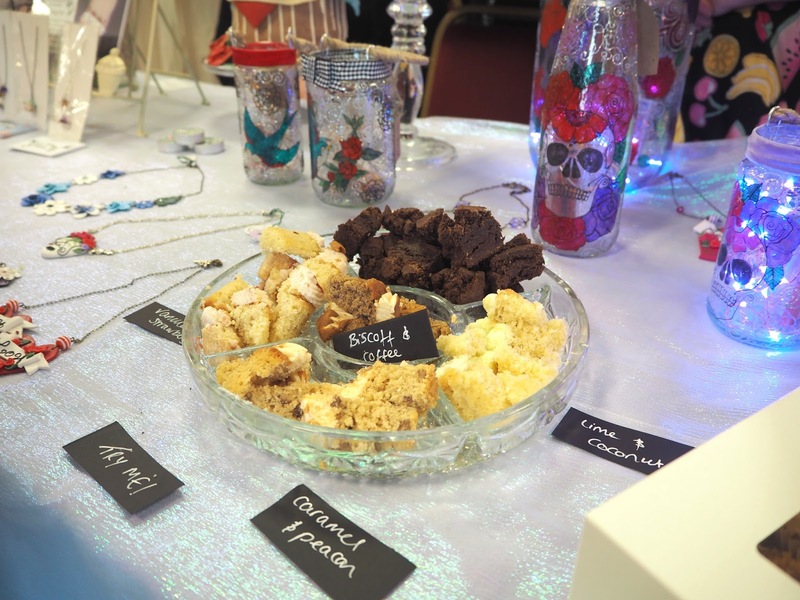 I had the best time at the event the sellers were all so friendly & interesting to talk to (people seemed quite interested that I was a blogger too!) plus their handmade pieces were incredible. Everyone's displays were beautiful and so well thought out, I had a wonderful time photographing everything. 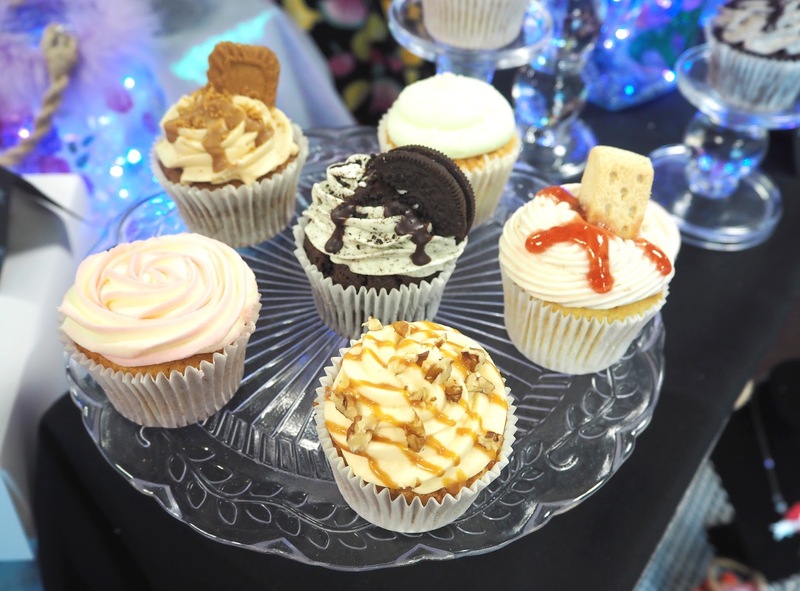 Plus I ended up trying many delicious cake samples which was like heaven! 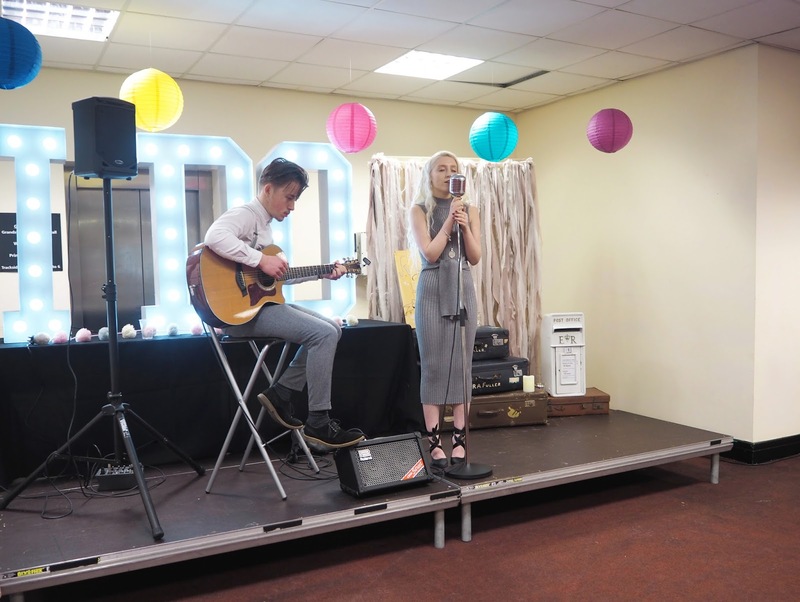 There was some fantastic live music in the centre of the Grandstand Hall as well as some free craft workshops held by some of the makers throughout the day. 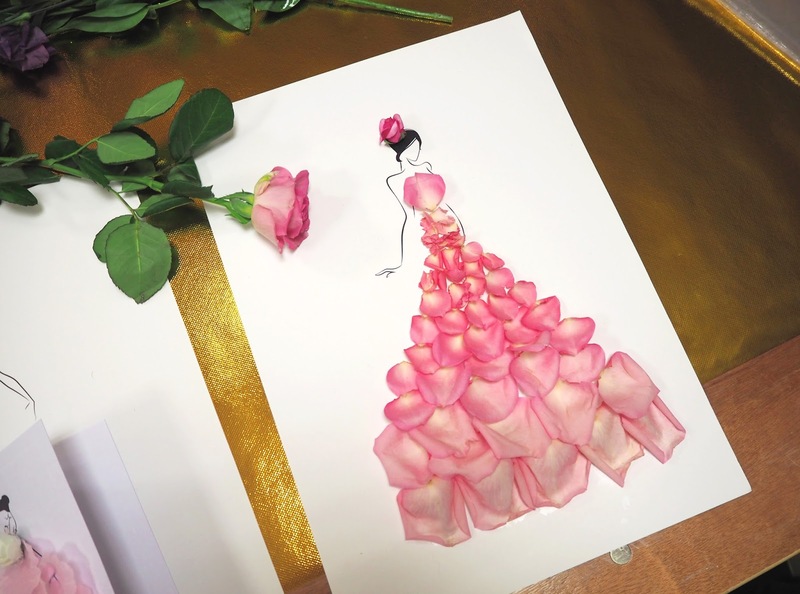 I went to one held by the lovely Georgie St Clair and she showed us how she creates her Petal Dress Artwork. 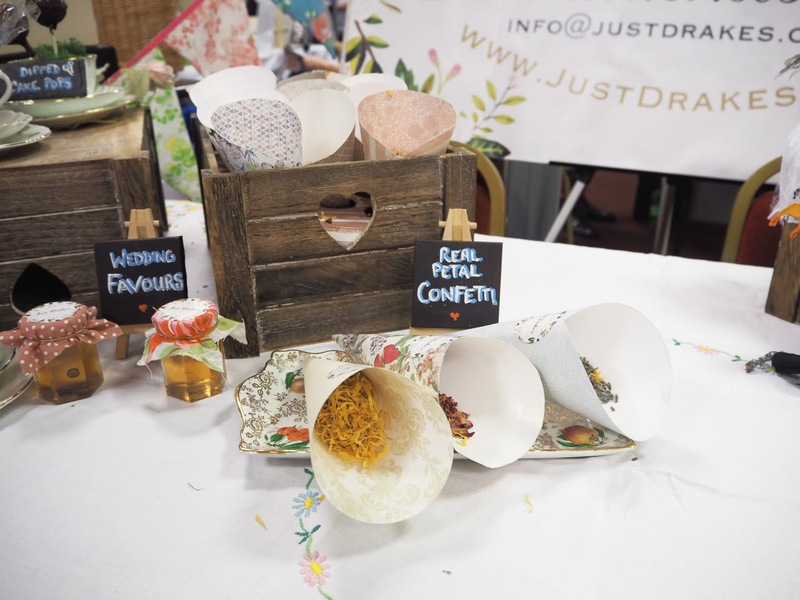 You could use real petals or faux silk ones and although the real petals looked better I wanted my design to last so I could take it home with me so I opted for the faux ones. I made a card using one of Georgie's prints and went for a pink ombré effect which I think turned out quite nicely. 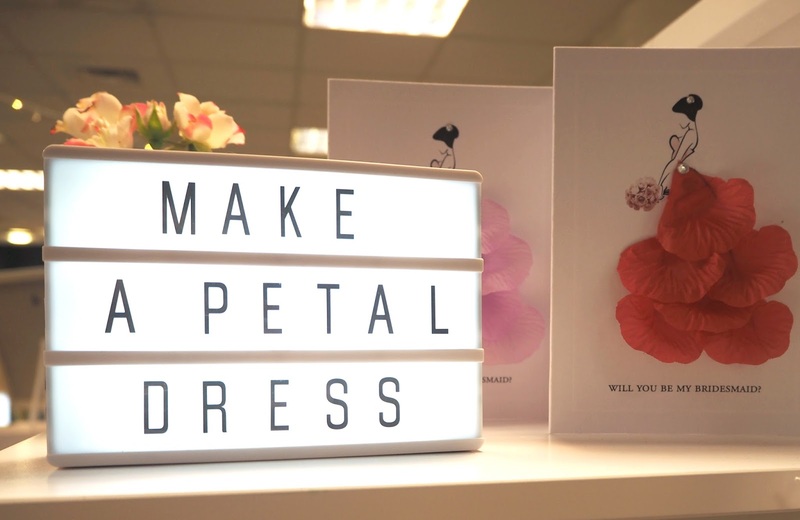 This is an activity she is now going to be making available for Hen Parties, making petal dress artwork with your girls and some prosecco, I think it's such a fun & different idea! Georgie has the most stunning Instagram feed so I highly recommend you go and give her a follow! I spoke at length to the lovely Alex behind Webb & Farrer who specialises in Wedding Bouquets and Flower Crowns. 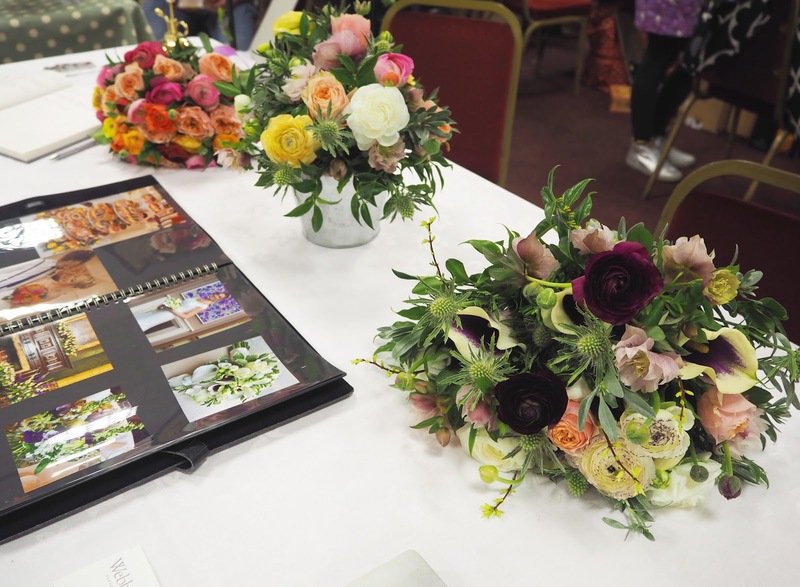 She showed me her beautiful portfolio and I particularly liked a Mexican festival, pom pom themed wedding that she created the most colourful bouquets for! 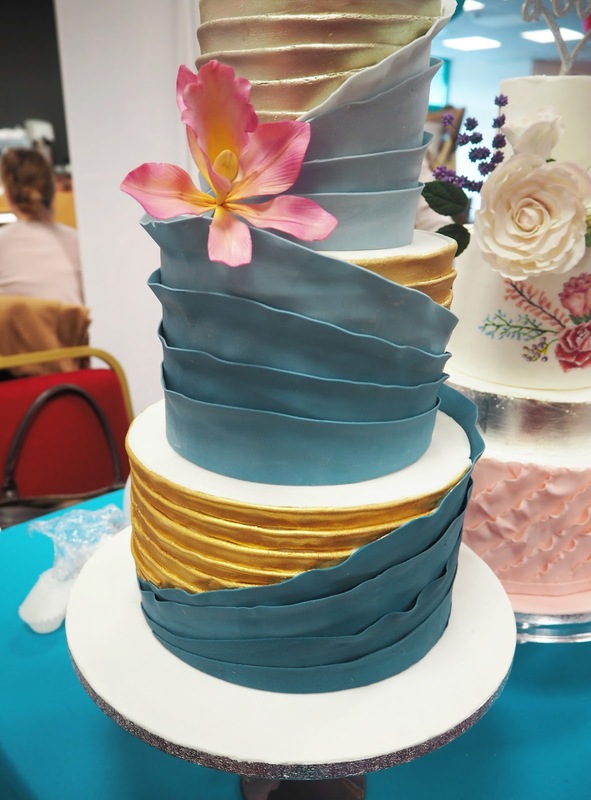 How stunning are these cakes by Sugar High Cakes?! 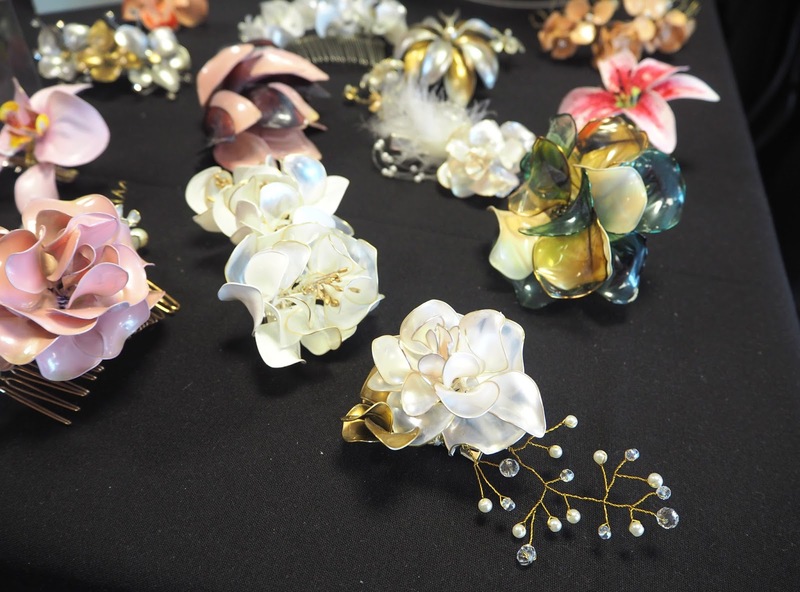 The lady who creates these masterpieces is called Dee Farrance and she is based in Worthing, West Sussex. 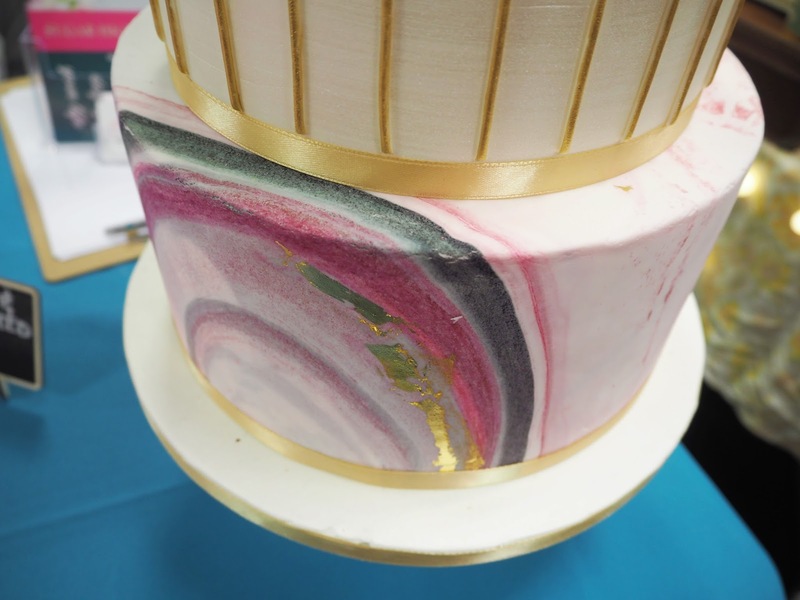 I completely fell in love with the marbleised effect in the fondant icing in the above picture, in fact I think I have decided that this is what I want for my wedding cake when I get married one day, otherwise I will have to create an occasion for it! 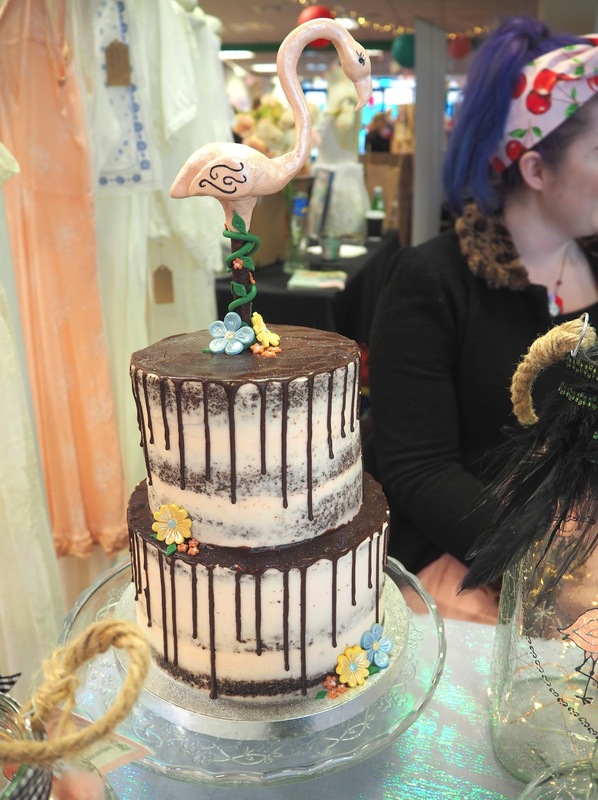 Her flavours were just as incredible as her designs, I sampled a particularly delicious chocolate cake with a passion fruit filling and a lemon and poppy seed one. 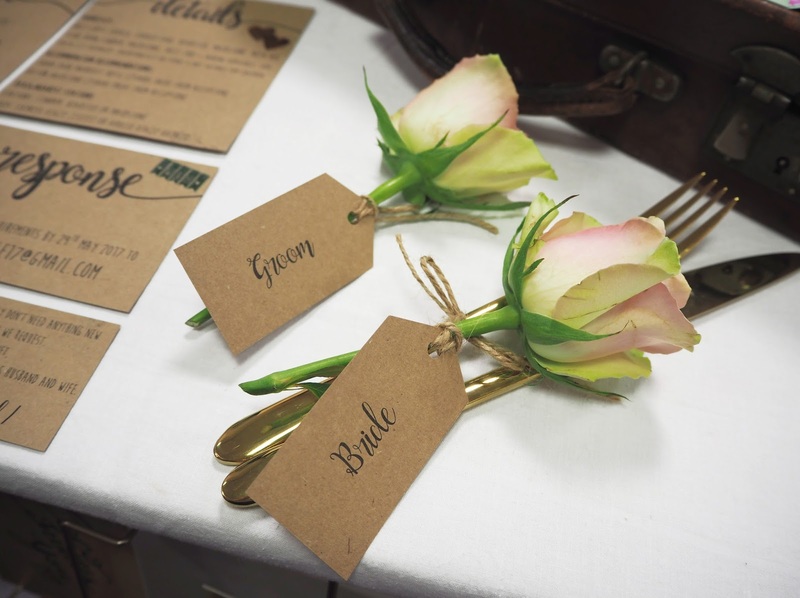 I thought these place names, favours & decorations by Love Oak looked so effective and perfect if you're gong for a rustic, outdoor or woodland themed wedding! 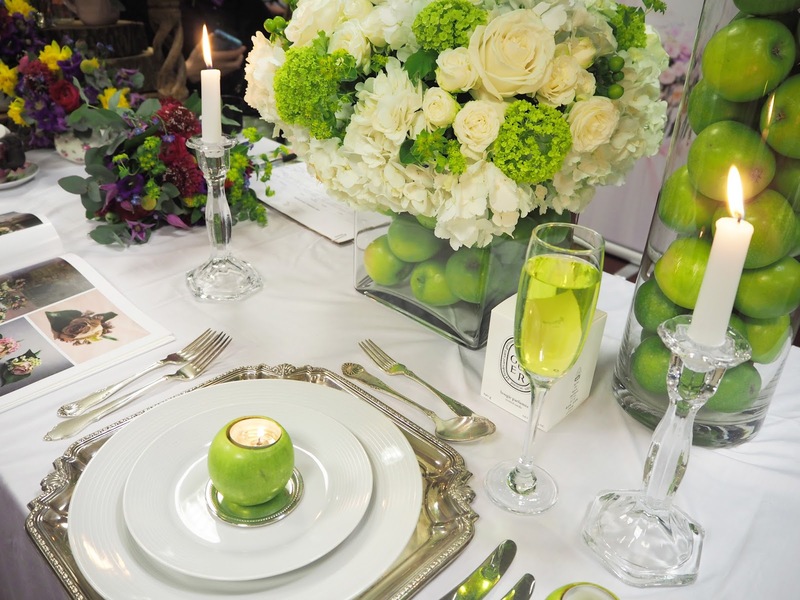 Noura Scents table was the sparkliest in the room, so naturally it appealed to my inner magpie! 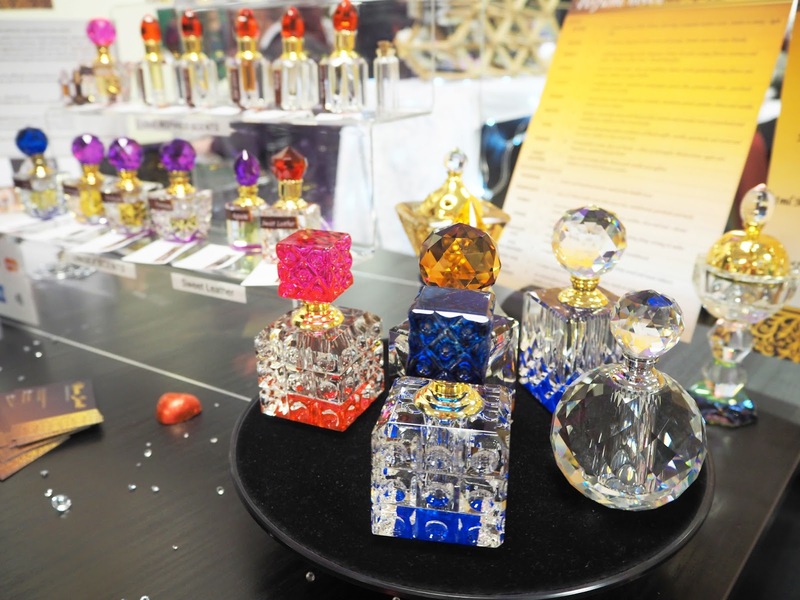 The lady who creates these perfumes was really friendly and told me all about how she makes her alcohol free perfumes and sources the prettiest & most unique crystal bottles. I think they would make wonderful thank you gifts, perhaps to the bridesmaids & mothers of the bride & groom. She was kind enough to give me a few samples and my favorite scent was called Entice. 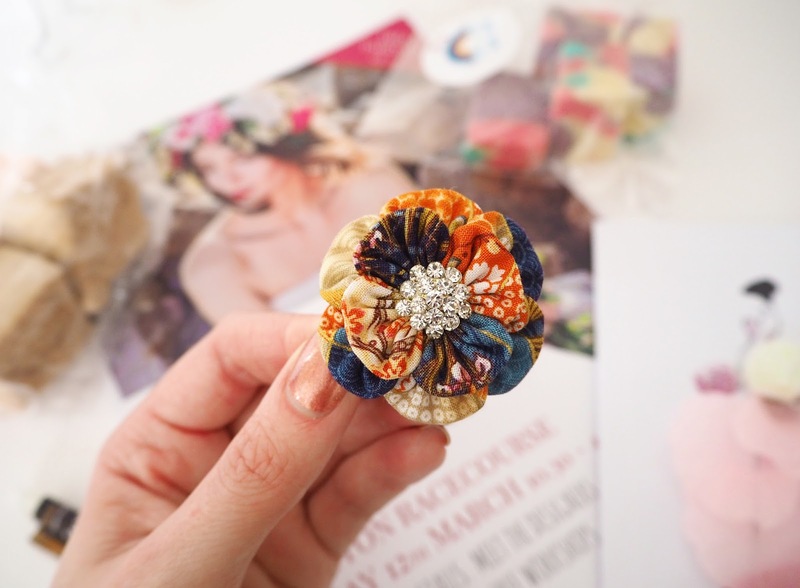 I have a real thing about cute little hair accessories so when I saw these beauties by Love Dainty N Arty I just couldn't resist buying one (scroll down to see which one I chose)! 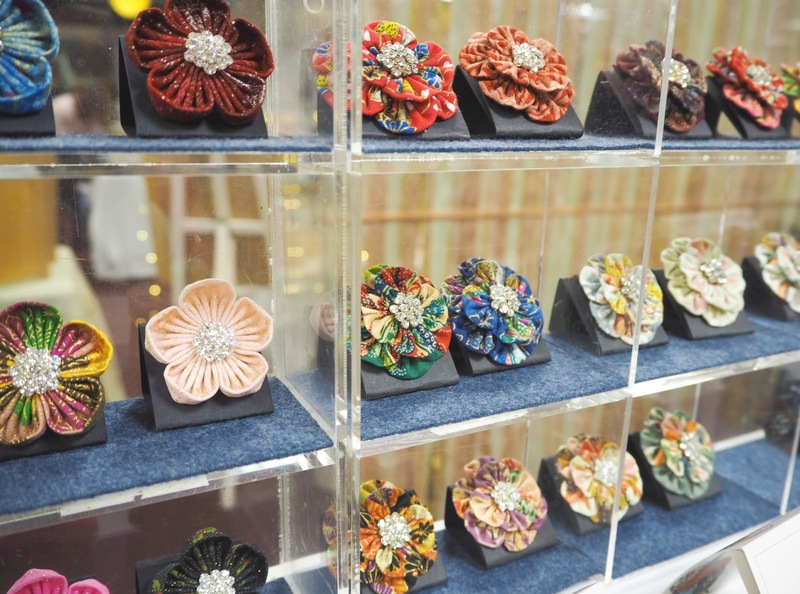 I thought they looked really unusual with the pretty fabrics and sparkly centres and very well made too. Can you tell why I was immediately drawn to this stand?! 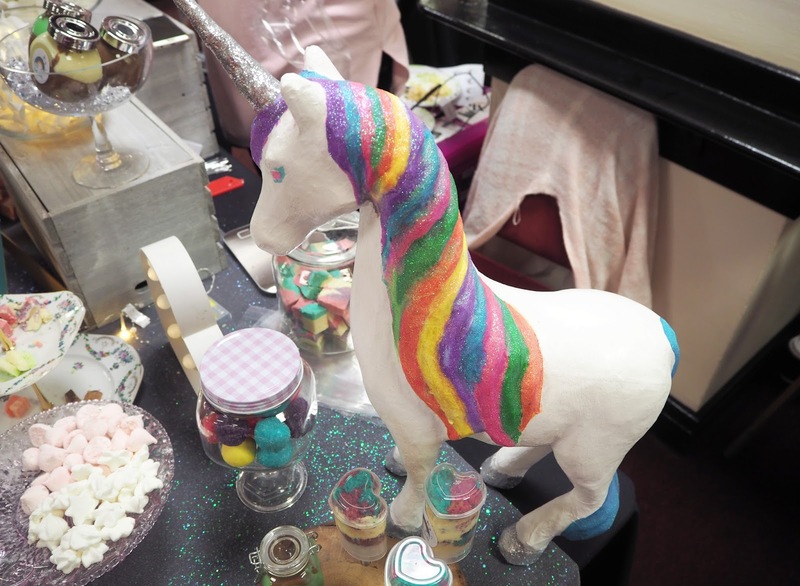 Unicorns (my spirit animal) and sweet treats galore! 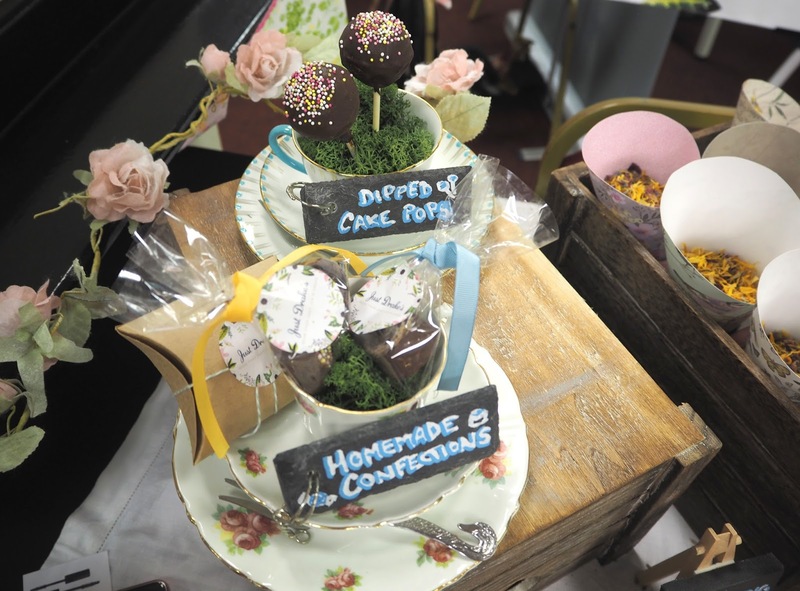 Neat Treats create the most unique sweets which I think would be great to use as wedding favours or thank you gifts. 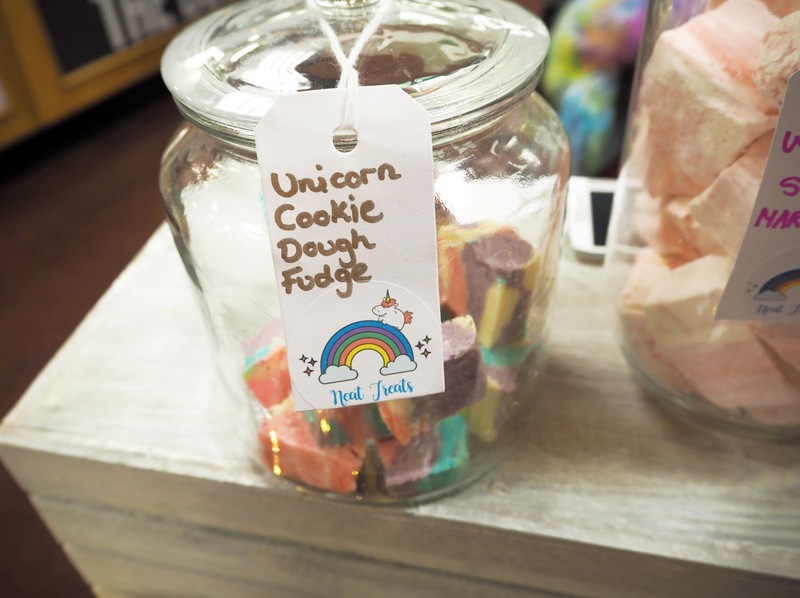 I picked up some Peach & Prosecco Marshmallows, Salted Caramel Marshmallows and I could resist a large bag of unicorn cookie dough fudge (which was DIVINE! ), I had to stop myself from pinching the giant unicorn decoration before I left! 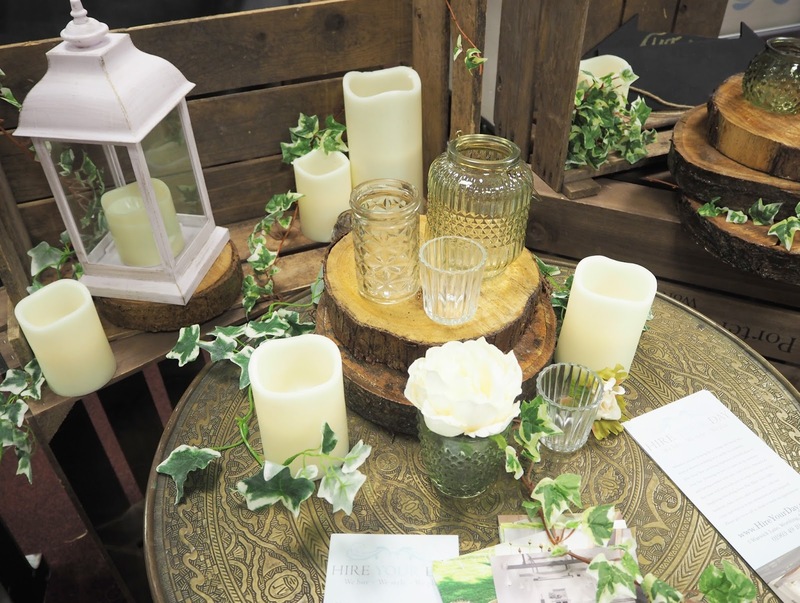 Vintage Rose Studio's stand was one of the first to really catch my eye, not only because their flowers were so bold and colourful but they'd hollowed out green apples to use as tea light holders and table decorations! I thought it was such a simple yet really innovative concept and I just loved how effective & striking it looked on the table. P.S The image at the top of the post is of their display too! Just Drakes is run by a lovely lady who only recently got married herself. She was telling me how she's always been creative & loved crafting things, like myself, and ended up making many things for her own wedding too so all those ideas were showcased here at the event. 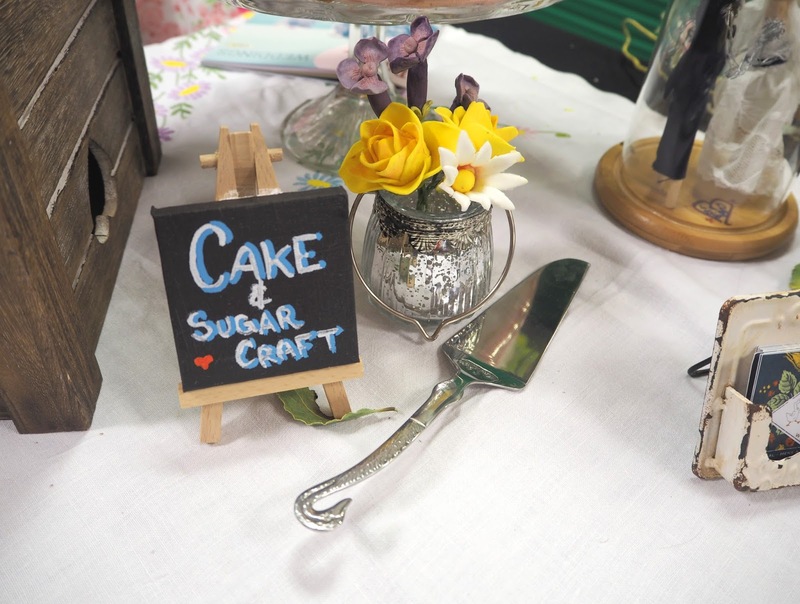 Everything has a real vintage inspiration running through it and her talents stretch to making cakes, cake pops & sugar craft decorations, preserves, real petal confetti cones and much more! 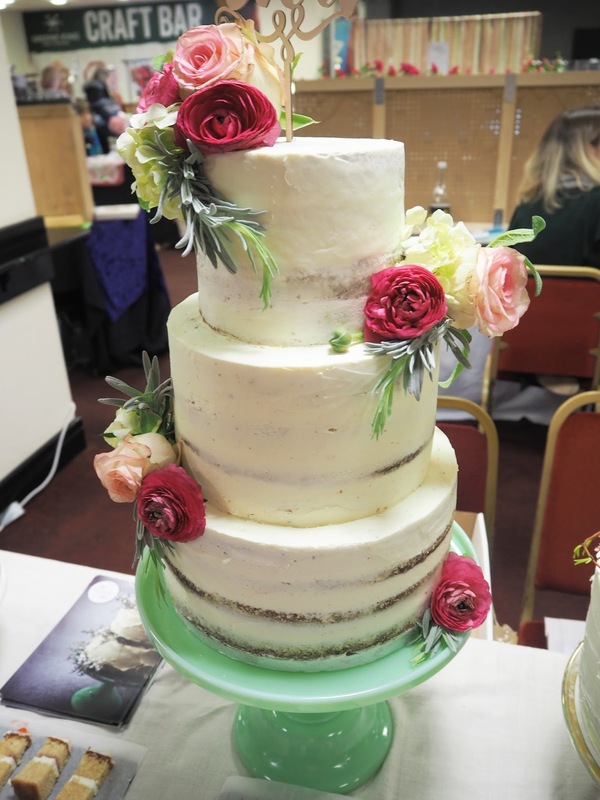 Beautiful cakes by Hove based company Bunston Bakes adorned with flowers. I sampled the chocolate and salted caramel and lemon and raspberry cakes which were absolutely divine. Gorgeous hand crafted lingerie and accessories by Unmentionables. 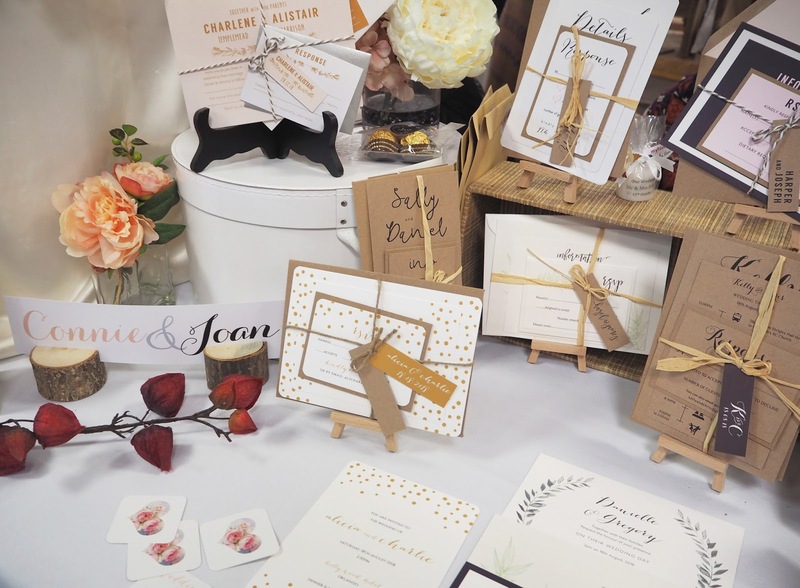 Exquisite wedding stationary by Connie & Joan including wedding invitations and table plans. 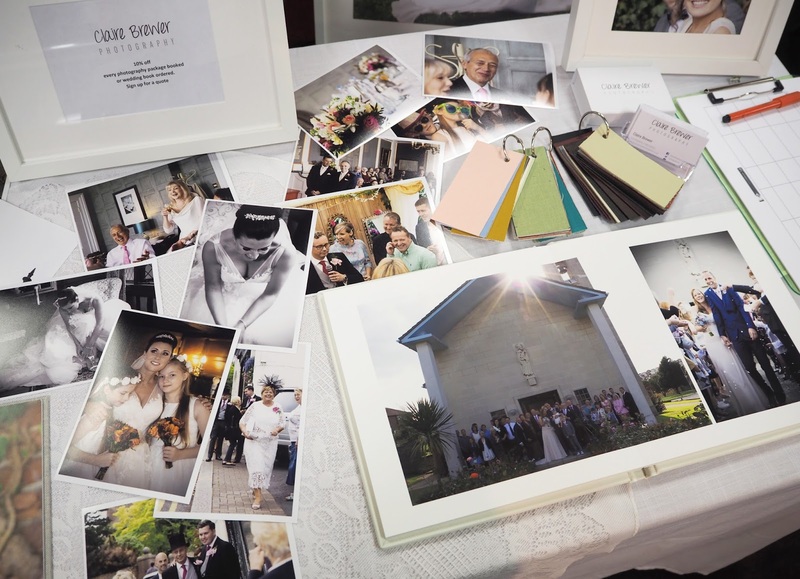 Their website also offers the chance to create your own wedding stationery using templates which Lizzie has designed. You can simply edit the templates and then print them. 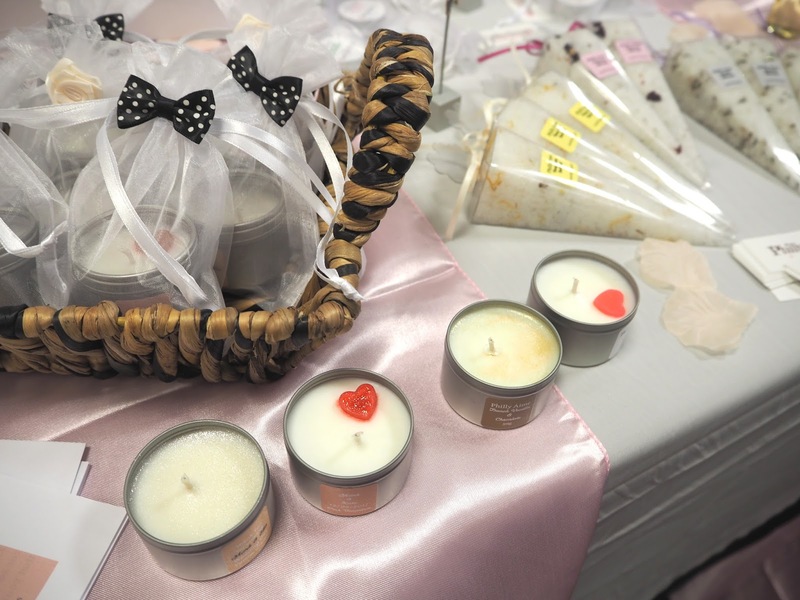 Philly Aime makes the most luxurious bath and body treats as well as candles that are unique, affordable and handmade in the UK. 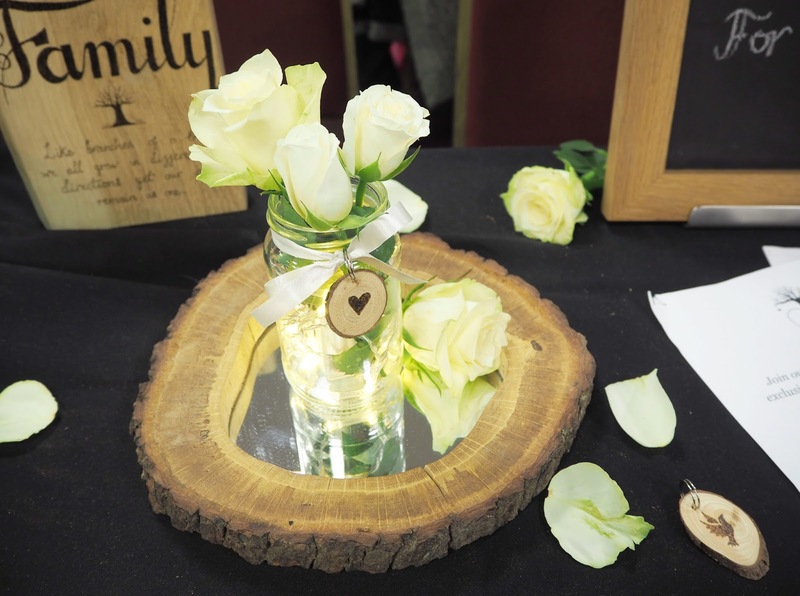 I think they'd make perfect little table decorations, wedding favours or bridesmaid gifts if you're looking for something a bit different. Inspired by nature Twisted Glamour create unique adornments, headwear & hair accessories for brides seeking something sensational for their wedding day. 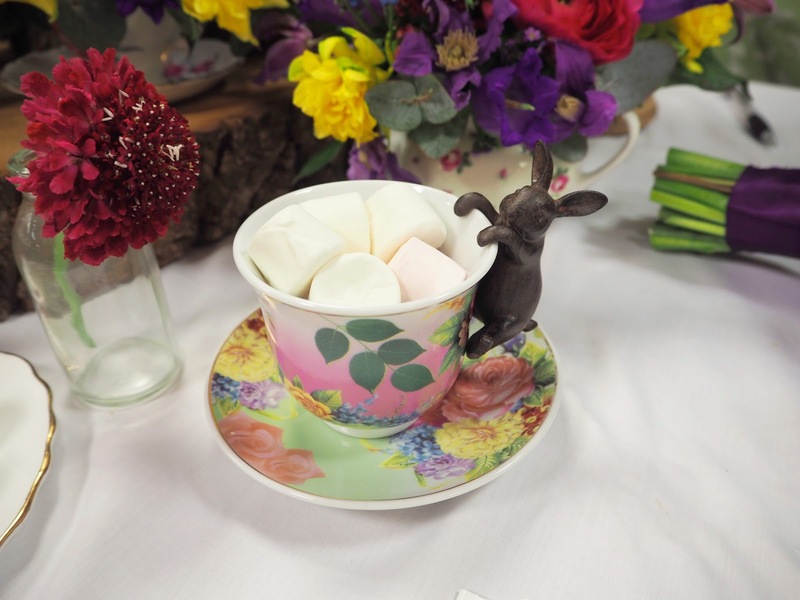 These fantastic images are from Claire Brewer Photography. 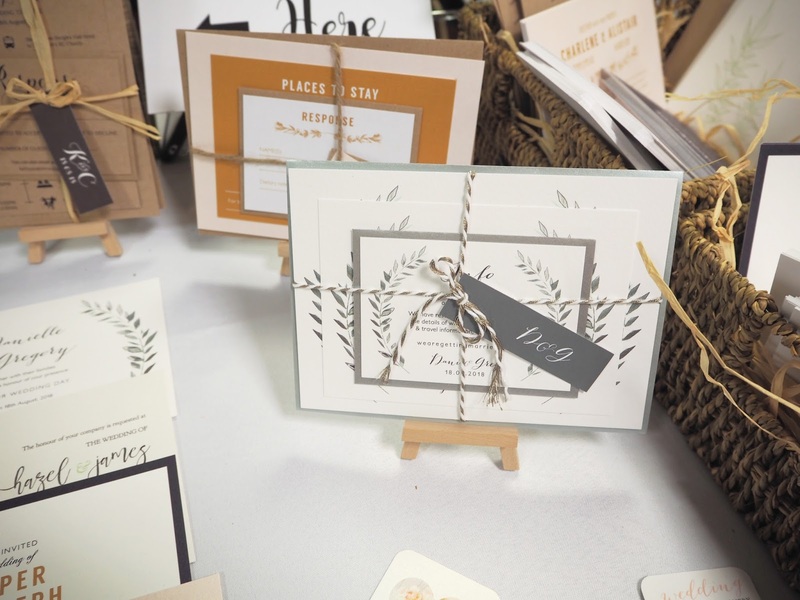 Bespoke invitations, wedding stationery and fine paper goods by Coco Invites You. 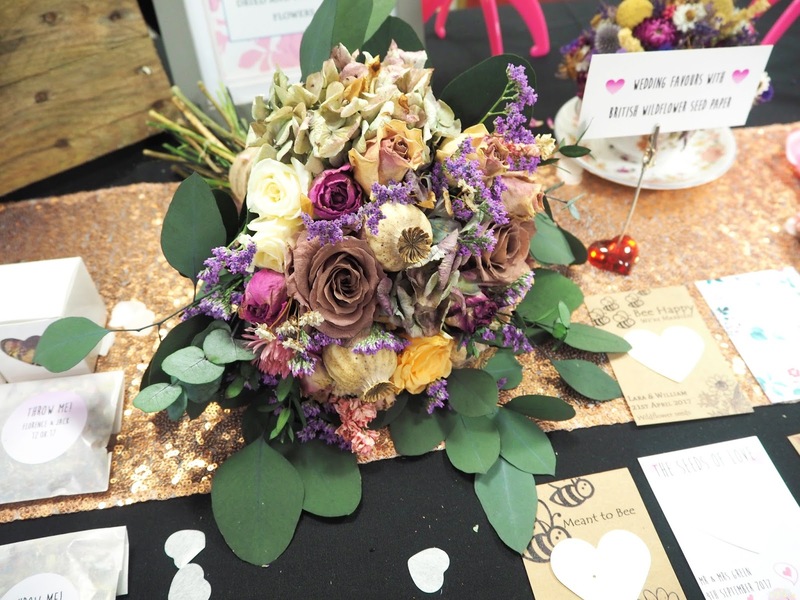 Lotus Floral Art make stunning, long lasting wedding accessories and decorations using dried and preserved flowers. 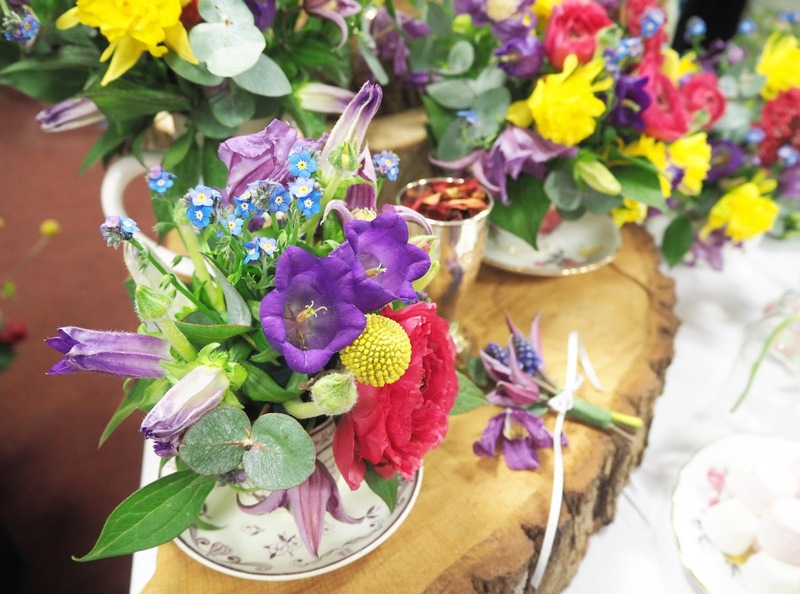 The major advantage of using dried flowers is they last for years when looked after correctly, the create bouquets, floral crowns, button holes, corsages, wreaths, table decorations, wedding stationery & more. In the same way that I was drawn to Neat Treats stand I made a beeline for this one!! 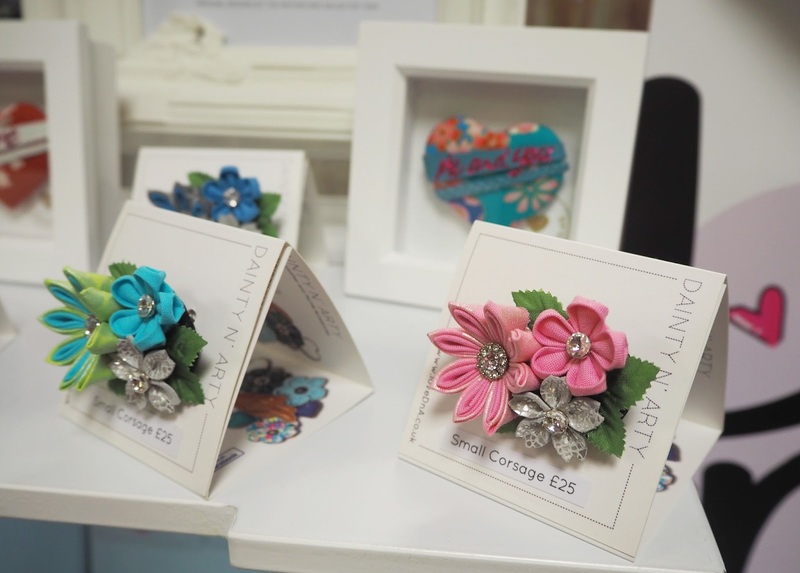 I love the kitsch, retro style of Guns N Posies products, there were lots of flamingo themed pieces going on (sold!) and everything just looked so cute! They are a mother-daughter business and were really friendly. 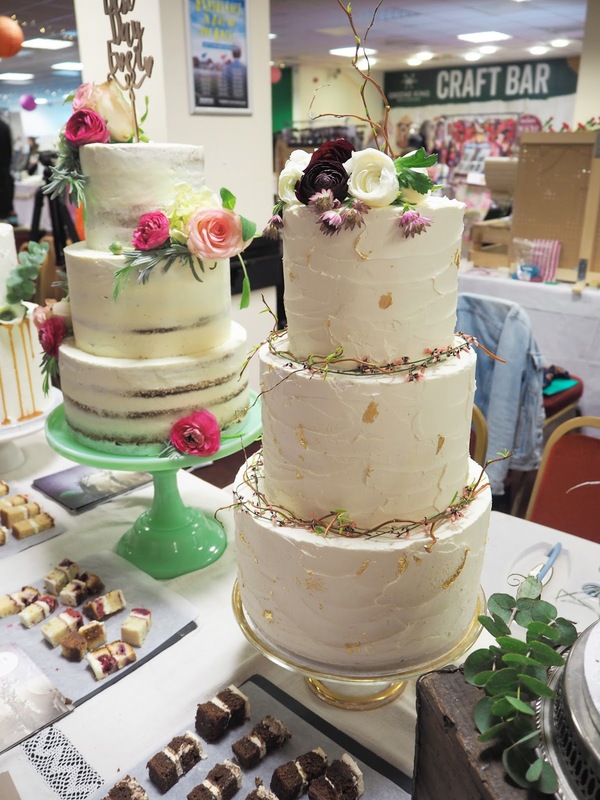 Their cakes were incredible as well with some really exciting flavour combinations that I hadn't tried in cake form before such as biscoff & coffee and lime & coconut. 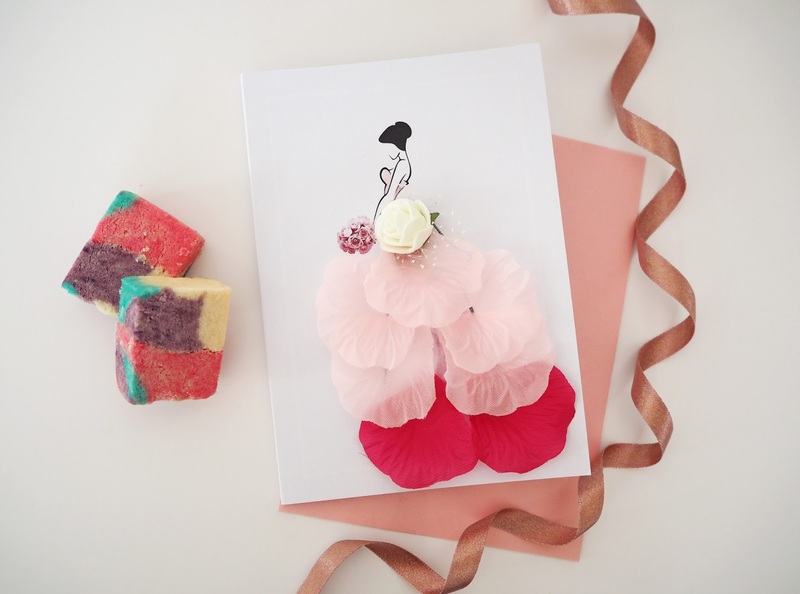 They have one website for their accessories & homeware and a separate one for their bakery. 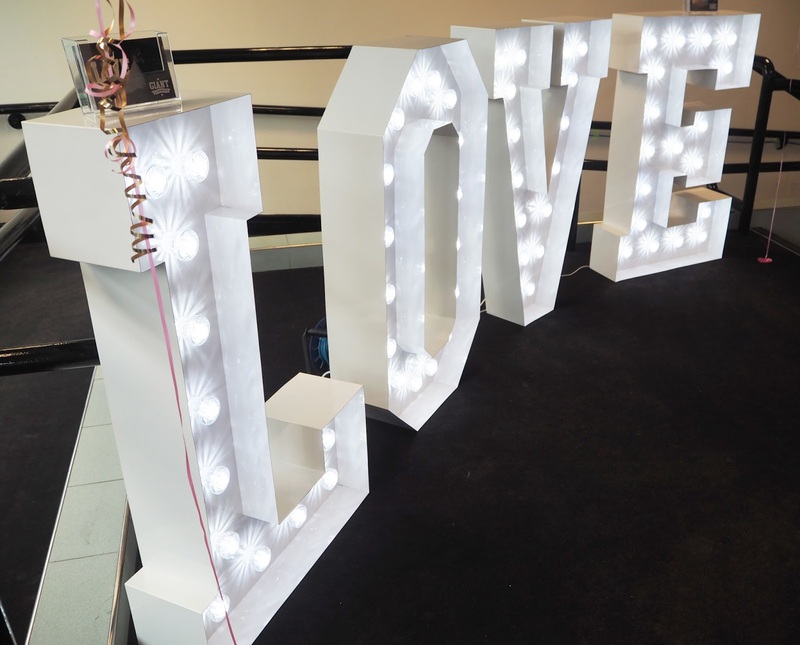 Colour Pop are a venue styling team specialising in creating memorable weddings through beautiful, original designs such as chair decorations, quirky centrepieces, original favours and colourful ceiling installations. That 'Love' balloon I really liked as well as the adorable pink flamingo! Making Flower Petal Art in Georgie St Clair's Workshop. Just give me some paper and glue and I'm as happy as I was when I was five - can you tell?! 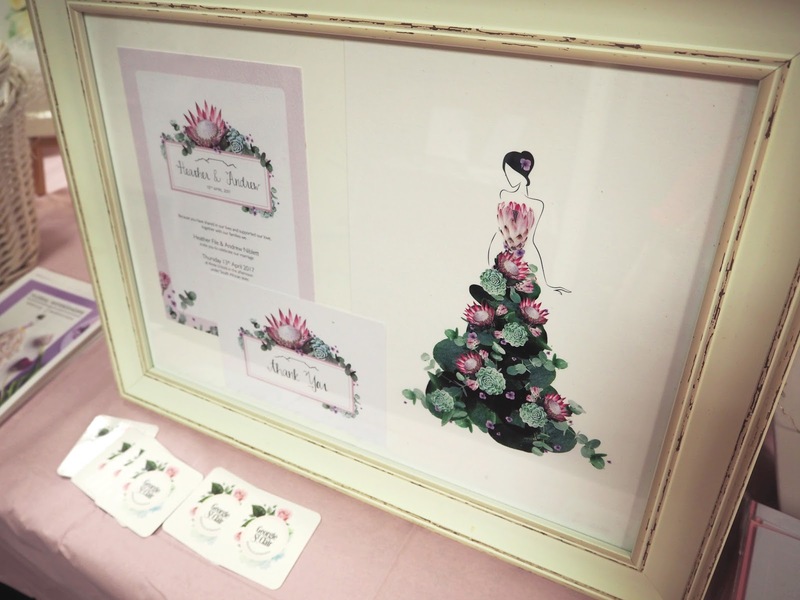 Georgie is a designer and illustrator drawing on the beauty of the natural world to create stylish botanical and floral art prints, stationary and custom floral fashion illustrations. 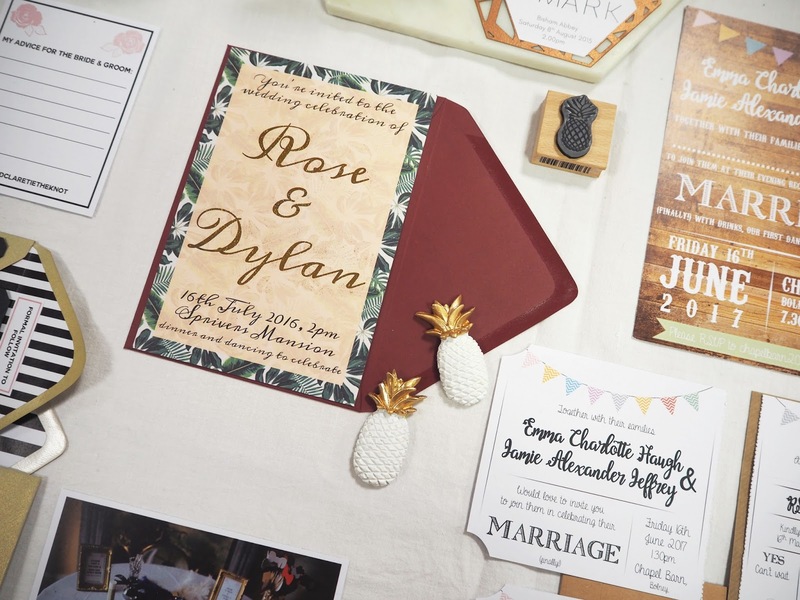 She can provide custom wedding logos and wedding stationary, incorporating the flowers you have chosen for your special day, into the design. 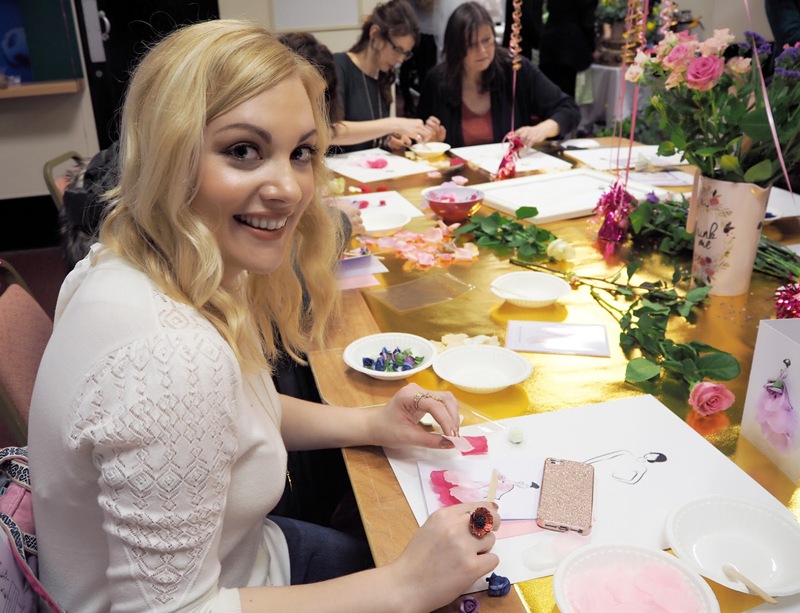 In addition, Georgie offers these hen party workshops which I had a taster of. 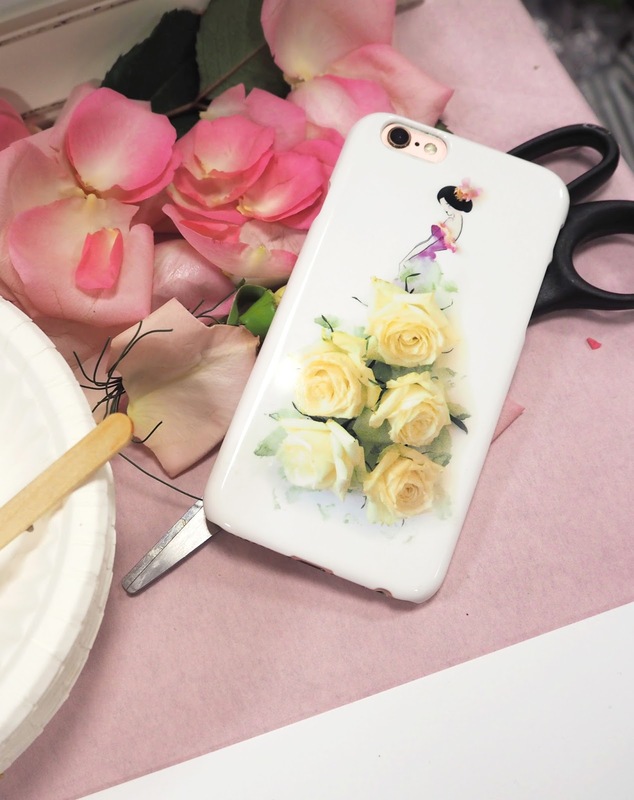 Also check out Georgie's phone case (pictured below) which is a sneaky preview of a brand new product launch for her very soon! Some of the lovely things I picked up at the event. 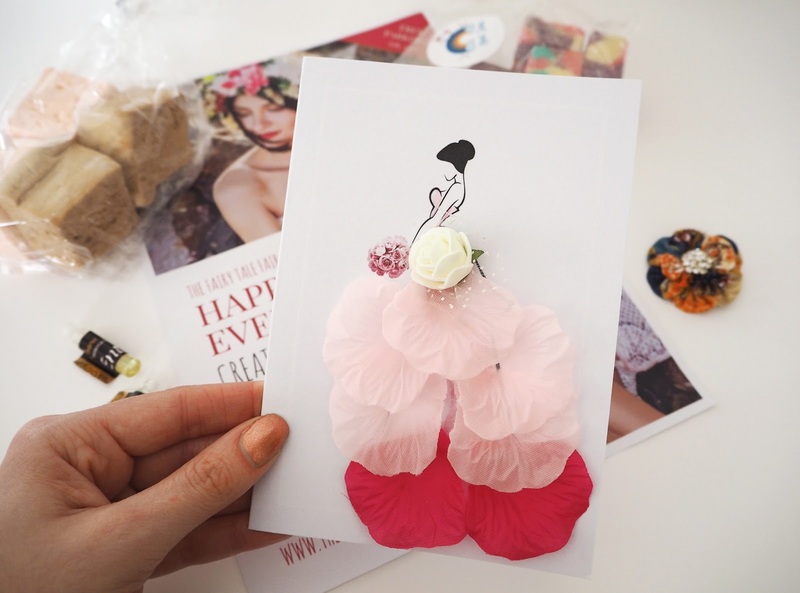 How beautiful is the hairclip I chose by Love Dainty N Arty?! I may have to go online and buy some more for Summer! 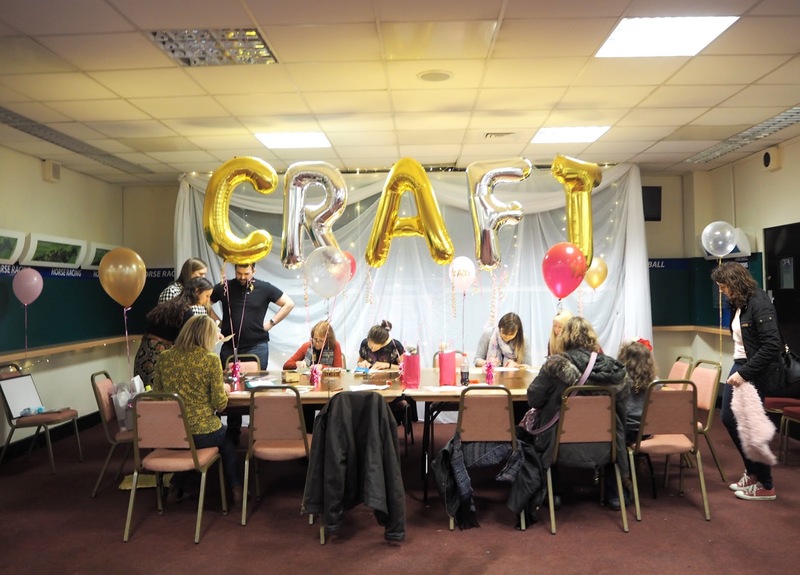 There were so many more fantastic creatives and crafters at the wedding fair, I wish I could've featured every single one of them in my post but you can view the list of stallholders here. Sunday 9th April at The Charmandean Centre in Worthing 10.30am - 4pm : An Easter Fair in aid of St Barnabas. Saturday May 20th at The Open Market in Brighton 10am - 5pm : A Brighton Fringe Festive Special. If you wish learn more about The Fairy Tale Fair and where they are holding their next craft fair visit their website. You can also follow their Facebook, Twitter and Instagram accounts. 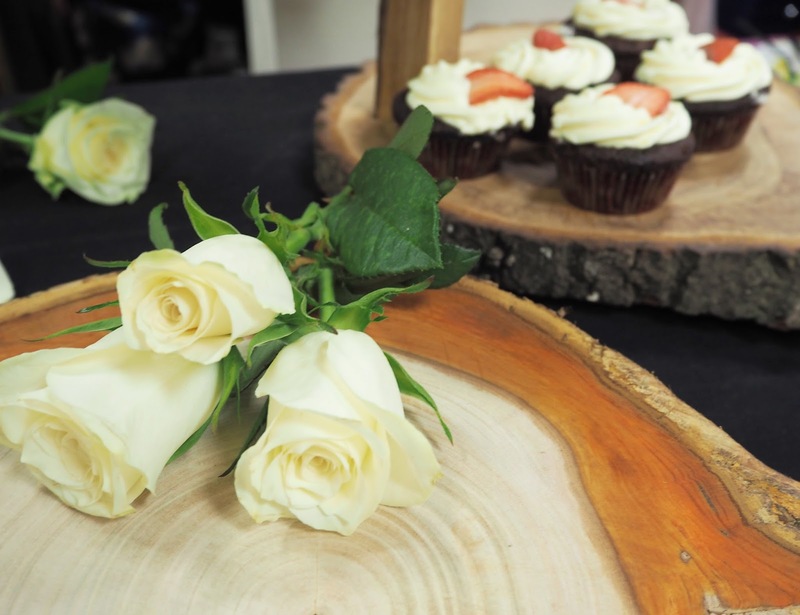 What kind of handmade pieces would you pick for your own wedding? 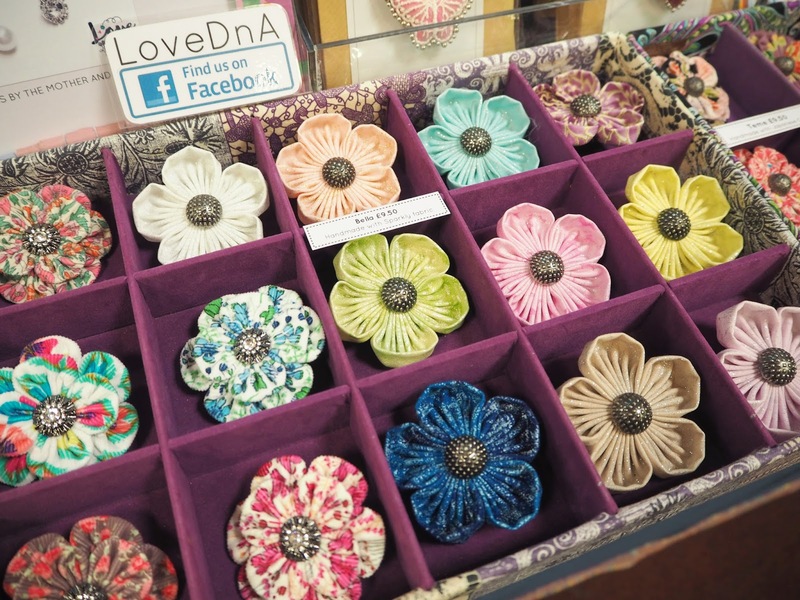 Would you/have you even gone down the completely handmade route? 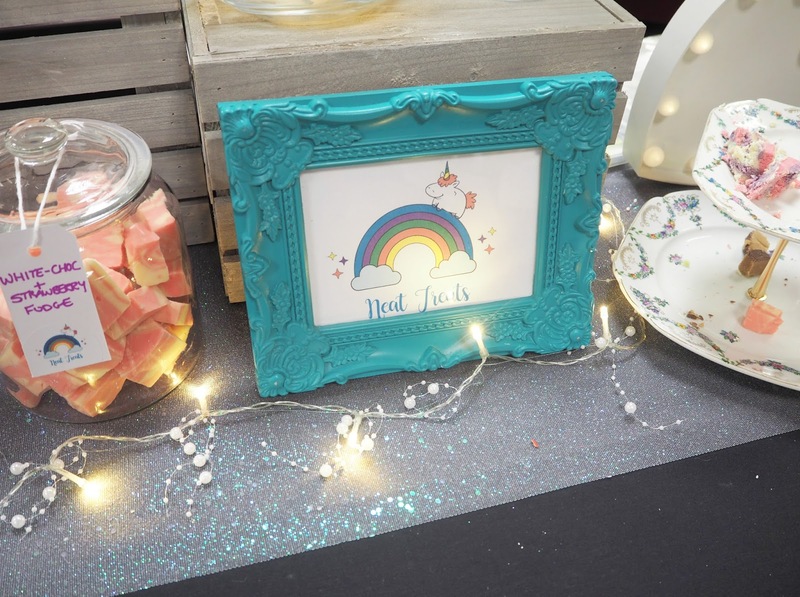 Thanks so much Katie, it was lovely to meet you and we really enjoyed the fairy tale fair, a must-attend event! I think that this place is really suitable for any size of gathering. By the way, they offer a day care room with lots of toys for children. The food is always delicious and the service is always great. Also the view from NYC wedding venues is absolutely amazing.